Visegrad Andricgrad the new attraction in Bosnia together with famous bridge. The bridge itself is the main tourist attraction in this small Bosnian town. Visegrad Andric grad the new attraction in Bosnia together with famous bridge. 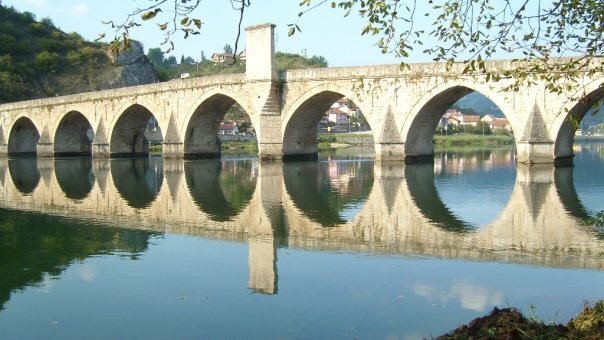 The bridge itself is the main tourist attraction in this small Bosnian town.The main architect of the bridge was Mimar Sinan, the greatest architect of the Otoman empire. The bridge itself has 11 stone arches and big stone portal and sofa in the middle. The sofa looks like a square stone bench, where you can sit and enjoy the scenery. There is a beautiful summer terrace near the bridge, and this is the main tourist spot in the town. The terrace has a great view over the bridge. The best way to exploring the bridge is to take a ride in one of the tourist boats, so you can enjoy the Drina river at the same time. Before you see the Visegrad Bridge, you should read the book “Bridge over Drina” by Ivo Andric. You will fall in love with the bridge, which is the main character of the book. The book is the main reason for many people when deciding to visit Visegrad. When you see the bridge for the first time it is like it is described in the book; a magnificient massive stone bridge, over the emerald green river Drina. For those who haven’t read the book, the bridge was built in 1577 by Mehmed pasa Sokolovic, a Serbian boy who become a grand vezier of the mighty Otoman empire.That is the reason why this bridge is also known a Mehmed pasa Sokolovic bridge. You may be dissapointed to find out that the old caravan saray from the book is destroyed, altough the old Lotika hotel building is still there. If you are interested in old architecture, or you are travveling across Bosnia you should definitely visit Visegrad, at least for one day. Andrictown (Andrićgrad) is a tourist, cultural, administrative and educational complex. It is situated on a peninsula between the rivers Drina and Rzav in Visegrad. Andrićgrad is a project of a famous film director Emir Kusturica, the stone town inspired by the literary works and characters of Nobel Prize winner Ivo Andric. It’s architecture is a mix of different eras and styles that passed throughout Visegrad history: the Byzantine style, the Ottoman period, the Renaissance, the Classicism. Some of the main objects of Andrićgrad are: Ivo Andric institute with a centre for Slavic languages, Fine arts Academy, Town hall, renaissance theatre, multiplex cinema, accommodation objects and much more. The whole complex will be finished in June 2014. It is estimated that Andrićgrad will become one of the biggest tourist attractions in the region, together with Mehmed pasa bridge, Drina river boat cruise, and reconstructed narrow gauge tourist railway Visegrad – Mokra Gora.